Yesterday in the mail I received a nice sized packet from Harry, my WWII navy veteran friend. As promised, he included a few pages from my book which included the red markings of his questions and/or comments. His comments were thoughtful and kind, and fortunately included a sentence where I had neglected to fill in a number. You can never have too many sets of eyes looking over your manuscript! Also included in the envelope was a stack of Ex-CBI Roundup magazines. While the magazines themselves list dates ranging from 2003-2006, they are actually reprints of the magazines that were written in the 1960's. The Ex-CBI Roundup was established in 1946 as a way for the troops who served in the China-Burma-India theater to reminisce and keep in touch with one another. I wonder if my dad ever knew about these? Anyway, Harry thought that I might enjoy looking at them and perhaps gather additional material for the book. God bless Harry! 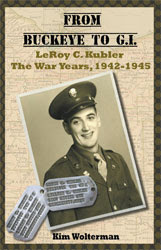 Two weeks ago I mailed copies of my dad's book off to the two veterans who offered to review the book for me, and hopefully write a quote to be used on the back cover. I was getting a little nervous as I had not heard back from either one of them. But tonight Harry, who was on the transport ship with my dad both to and from India, sent me an email. He had indicated he would have his red pen handy when he received the manuscript, so I wasn't sure what to expect from him. But in fact he told me the book required little editing as it is well written and I must have used spell-check. He is mailing me a few comments along with some additional newsletters that he thought I might find of interest regarding the CBI Theater. He also provided a nice paragraph for the back cover. 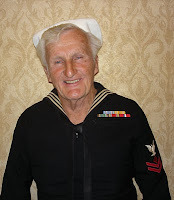 It is a little heavy on the USS Anderson ship, but that is his frame of reference after all. One review down, one to go! The Big Read on Saturday began at 9:00, but I wasn't needed at the booth until 10:00. Publicity for the event was about nil, which is typical for St. Louis. If you aren't shooting someone or crashing a car on Interstate 44, you just don't make the news around here. I got to the booth at my designated time, cooler containing water and my lunch in hand. We had a steady, if small, stream of event goers throughout the day. Not too many seemed interested in purchasing books, but perhaps that was due to the book fair a few booths down where you could purchase books for a fraction of their once new price. It also hit 87 degrees so I think the turnout was down from previous years. At 2:00 I helped at the main stage where the SLPA contest winner would be revealing her book cover and giving a reading of her newly published first novel. 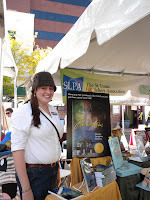 I had brought along my camera, so I also took some photos to put on the SLPA facebook page. While I know that Mandy was nervous about speaking in front of an audience, she was a natural and did a great job. She first spoke about how she had come to write the book (NaNoWriMo), and then how she found out about the SLPA and the contest. Following that she read from the book, and then headed back to our booth to sign copies of her book. She did well, selling around 30 copies I would guess. I, on the other hand, sold exactly 1 of my books, and that was to Mandy! 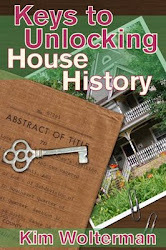 She is interested in house history and in fact her novel is a story involving genealogy and an historic house, so we have a lot in common. Having said that, do I think that having a booth at The Big Read is a waste of time and money for myself and the SLPA? Not at all, and here is why. We had a nice number of people inquiring about the organization and our upcoming meetings, so it was good exposure for SLPA. And for myself, a realtor asked me about the possibility of buying my book in quantity to give out as house warming gifts to her clients. She would never have known about my book had she not seen it at The Big Read. So even though I spent 6 hours of my day at the event and didn't sell enough books to cover the cost of having them in the booth, I still got exposure for my title and you can't put a monetary value on that. Tomorrow is The Big Read in St. Louis, a free festival designed to inspire people to pick up a good book and read. Authors will be signing their books and doing readings, the St. Louis Publishers Association will give a presentation on how to publish your own book, story book characters will roam the crowds and other entertainment will be provided. There are also booths displaying their wares, and the St. Louis Publishers Association offers the opportunity to its members to have their book(s) available for sale. I had volunteered to help staff the booth, and also will have copies of my book "Who's Been Sleeping in My Bed(room)? Researching a St. Louis County, Missouri Home" in the booth. One of the things you always have to be thinking about as an author, particularly a self published one, is marketing your book. I try to be on the lookout for unique opportunities to find readers. Because my book definitely has a niche market, traditional book stores are not where I find my buyers. Instead I have been more successful in selling through specialty shops such as the Webster Groves Historical Society and St. Louis Genealogical Society stores, and the Missouri History Museum gift shop. Because The Big Read attracts educators and libraries from across the area, I'm looking forward to being able to talk up my book. Unlike some authors, I welcome the chance to have my book in the libraries. Because it is set up in a work book fashion, I think library patrons will want to go out and buy their own copies once they have a chance to see the book. If you are a self published author, I encourage you to seek out these alternative marketing venues. This weekend I buckled down to revise some of the low DPI pictures for the book. The only problem is now Windows won't let me open the ones I have worked on. It keeps telling me that I don't have permission to view the photos. Hello!!! It's my computer! My computer guy came over tonight and the best that he could work out was to install Picasa on my computer and have it be the default for opening any pictures from now on. The only problem is that it won't open the corrupt ones either, so I have to re-scan those documents and images. In looking at the forums online it appears this may be a Windows 7 issue. Grrrr... It's always something. I also cleaned up the book and printed out three copies this weekend: one for Jay from the Hump Pilots organization, one for Harry from the USS General Anderson organization, and one for the book designer. I mailed Harry's and Jay's copies today; I won't send a copy to the designer until I get the photo issues resolved so I can send him everything at once. Harry has already alerted me to the fact that he will have his red pen ready as he is a bit of a writer himself. Go for it Harry! I have been giving more thought to the book cover, in particular the back cover copy. I did go ahead and email the CBI Hump Pilots organization, and Jay replied back that he would be happy to read the book and write a comment for the back cover. That is exciting news as I believe it will lend credibility to the story. I have also emailed Harry Lagerstedt of the USS Anderson group to see if he will do the same for me. Since he was actually on the same voyage as my dad, I thought it would be fun to get a quote from him. The Anderson website is unavailable right now, so I hope that doesn't mean something bad has happened. Harry has been so sweet and helpful to me, and I know he is not a youngster. I probably need one more person to provide a quote, but I'm not sure who to approach. Perhaps someone from the Delhi veterans group in Cincinnati since that is where my dad was from. After I get that all settled, I'll need the back cover designed. Katie did a great job on the front cover, and I can probably email her the information and she can do it from school. Worst case scenario I can hire Camp Pope to do the work for me. This weekend I will be re-working the photographs and other documents in the book that don't meet the minimum DPI standards. Hopefully this will not be too big of an ordeal. This is when I really wish Katie was still at home to offer some guidance.